Lucerne (Luzern in German) lies at the north end of Lake Lucerne (Vierwaldstätter See) where the River Reuss flows out of the lake. The town, with its well-preserved medieval core, elegant historic buildings, and genial atmosphere, is one of the most popular tourist attractions in Switzerland. Many visitors come to see leading conductors, soloists, and orchestras perform at the annual summer music festival and at other festivals spotlighting blues, piano, and even marching bands. The Benedictine monastery of St. Leodegar was founded around 730, and the first mention of a town is of Luciaria in 840. Lucerne only became important after the opening of the St. Gotthard pass through the Alps in the 13th century, when its location made it a significant trading town. Lucerne is compact and easy to explore, with the old town and all the main sights within walking distance of the rail station. For tourists who love mountain scenery, the biggest attraction of all is Lucerne's location as a base for some of the most spectacular Alpine rides in Europe, with easy connection to Mt. Rigi, Mt. Pilatus, Mt. Titlis, and Jungfraujoch. While in Lucerne, it would be a shame to miss the trip up Mount Pilatus, going up by the cableway from Kriens and down by the cog-railroad. The half-hour ride from Kriens leads to another short cable car ride to the 2,070-meter Pilatus-Kulm. From here, it is a six-to-10-minute climb to the summit of the Esel - the central (but not highest) peak of Pilatus with magnificent views of the Alps. From the Pilatus-Kulm, it is a 30-minute walk to the Tomlishorn, at 2,132 meters, the highest point in this rugged limestone massif. Alternatively, you can take a boat to Alpnachstad to board the cog-railroad for a 30-minute ride at gradients up to 48% through alpine meadows and forests, over the rock-strewn Mattalp, up the steep rock face, and through four tunnels to the upper station on Pilatus-Kulm, returning via the cableway. If you don't want to deal with planning a trip and navigating your way to Mount Pilatus, a guided tour is a great option. The 5.5-hour Mount Pilatus Summer Day Trip includes a gondola ride and an aerial cableway ascent to the peak of Mount Pilatus, followed by a descent on the world's steepest cogwheel train. The tour ends with a panoramic one-hour boat ride across Lake Lucerne. The most characteristic sight in Lucerne is the Kapellbrücke, a covered wooden bridge running diagonally across the Reuss. Apart from being a picturesque centerpiece for Lucerne, the bridge, built in 1333, is interesting for the more than 100 17th-century pictures hanging from the roof rafters inside, depicting patron saints and scenes from the town's history. The Kapellbrücke was severely damaged by fire in 1993 but has been completely rebuilt and restored. Beside it is the octagonal Wasserturm, a 13th-century water tower more than 34 meters high and once part of the town's fortifications. The bridge and tower are among the most photographed scenes in all Switzerland. Several boat trips of different lengths explore the 38-kilometer-long lake, one of which, the William Tell Express, combines with a train excursion through the St. Gotthard Pass, linking Central Switzerland with the many attractions of the Ticino region. From May to September, you can travel by paddle-wheel steamer (out of season by a diesel motorboat) from Lucerne to Flüelen, enjoying a three-course meal in the ship's saloon, then take a scenic train ride as far as the towns of Locarno and Lugano. If you don't have time for a longer boat excursion, you can still see the beautiful alpine peaks and hear about the history and lore of the land around the lake on a one-hour Lake Lucerne panoramic sightseeing cruise. The 49-meter yacht has indoor and outdoor seating, as well as refreshments available, and you will be able to hear the commentary about the lakeside sights in English with the audio headset that's included in the tour. 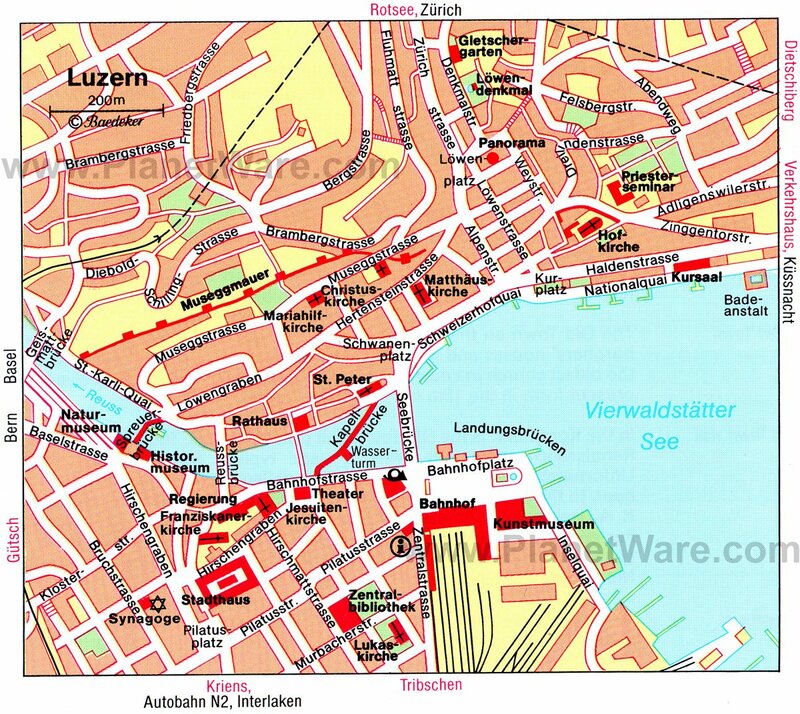 The Old Town of Lucerne, on the right bank of the Reuss, still preserves many old burghers' houses and little squares with fountains. Some of the timber-framed buildings bordering the stone streets are painted in bright colors, giving the Altstadt a fairy-tale atmosphere. In the Kornmarkt is the Altes Rathaus, the Old Town Hall, built in 1602-06 in Italian Renaissance style but topped by a very typical Swiss hipped roof. The adjoining tower dates from the 14th century. West of the Kornmarkt is the picturesque Weinmarkt with a Late Gothic fountain. In the Kapellplatz is the oldest church in Lucerne, St. Peter's chapel, built in 1178 but renovated to its present form in the 18th century. The Old Town is a delightful place to stroll, especially if you follow some of the narrow side streets. One of the signature experiences in Switzerland is to ride the cog railway from the shores of Lake Lucerne to an elevation of 1,798 meters on Mt Rigi. This is Europe's first cog railway, and you can ride in restored cars dating back as far as the railway's beginning. Some of the steam engines date to the 1920s. From the top, views stretch all the way to the Black Forest in Germany. One of the popular things to do is make a scenic circle route by taking the boat from Lucerne to Vitznau, where you board the cogwheel train to Rigi Kulm. Then take another cogwheel train down to Arth-Goldau and catch a train back to Lucerne. Surprising as it may be to have one covered bridge that has survived for several centuries, Lucerne has two. The second covered wooden bridge, the Spreuerbrücke, was built in 1406, and inside, on triangular panels under the bridge's rafters, are 45 paintings of the Dance of Death, known in German as the Totentanz. Painted between 1616 and 1637 by painter Kaspar Meglinger and his students, this is the largest example of a Totentanz cycle known to exist. These are framed in black, each frame inscribed with explanations in verse of the painting's subject and the names of the patrons who donated them. Some also have portraits of the donors. Just north of Löwenplatz is the famous Lion Monument, a huge figure of a dying lion hewn from the face of the rock ledge. Designed by Thorwaldsen in 1820, the monument commemorates the death of 26 officers and more than 700 troops of the Swiss Guards, mercenary soldiers who were killed while protecting King Louis XVI during the attack on the Tuileries in the French Revolution in 1792. The touching monument is one of the best-known sights in Lucerne. The large complex of exhibition halls and outdoor exhibits cover all forms of transport, as well as communications and tourism. Through rolling stock and railway locomotives and both models and actual examples of ships, aircraft, rockets, and automobiles, you'll follow the development of transportation from its earliest days, especially in its mechanized forms. An entire exhibit explains the construction of the St. Gotthard rail tunnel. A 3D film theater replaces the previous IMAX theater with the largest screen in Switzerland, and a 150-projector Planetarium also offers daily shows. Along the north side of Lucerne's old town is a wall built between 1350 and 1408, with nine towers constructed in differing styles. The part built around 1386 is still almost completely intact, and you can climb four of the towers - Schirmer, Zyt, Wacht, and Männli - for views across the city, lake, and surrounding landscape. The oldest of Lucerne's clocks, built in 1535, is in the Zyt tower and chimes hourly, exactly one minute before all the other city clocks. Inside the tower, you can see its mechanism at work. If you're at all interested in Post-Impressionist art, this relatively new art museum alone is worth a trip to Lucerne. Particularly strong in works by Paul Klee and Pablo Picasso, the collection also features important works of more than 20 artists of the 19th and 20th centuries, among them Cézanne, Monet, Chagall, Braque, Kandinsky, Léger, Matisse, and Miró. The 125 paintings and drawings by Paul Klee represent all periods of the artist's work and are arranged so you can follow the progression of his style and technique. The Picasso collection includes some of his earlier drawings but concentrates mainly on his paintings after 1938. Angela Rosengart, the Museum's founder, and her father knew these artists personally, and the museum was built to house her personal collection. Among the Picasso works are portraits he painted of her. Switzerland's first large church in the Baroque style was built for the Jesuits directly on the left bank of the Reuss between 1666 and 1677. The interior was updated to the Rococo style in 1750, with an outstanding painted ceiling and ornate faux marble side altars. Check the schedule for concerts on the church's magnificent organ. This remarkable relic of the Ice Age includes glacier-polished rock, erratic boulders dropped by the retreating ice, and 32 potholes formed at the base of waterfalls of melting glacial ice. Some of them are huge, and their formation is demonstrated by a working model of the process. Exhibits also show how the changing climate affects the earth. Higher up are an early climbers' hut and a lookout tower. In the museum are relief maps of Switzerland, groups of alpine animals, rock specimens, and historic rooms. Not at all related to the rest of the museum but great fun, especially for children, is the labyrinth of mirrors. The adjoining park is a good place for a picnic. On the site of the eighth-century Benedictine monastery of St. Leodegar is the twin-towered Hofkirche, which was rebuilt in 1634-39 but preserved the 1525 towers of the previous church. It is considered the most important Renaissance church in Switzerland. On the north tower is a Late Gothic sculpture depicting the Agony in the Garden. Inside, the carved pulpit and choir-stalls are from 1639, and in the arcades surrounding the church are the tombs of members of old Lucerne families. Although the overall interior is simple and fairly plain, this just highlights the exuberant baroque gold altars. In the summer, recitals on the church's famous organ are held here. About 35 kilometers south of Lucerne, Engelberg-Titlis is Central Switzerland's biggest winter and summer vacation destination and one of Switzerland's top 10 ski resorts. Towered over by 3,239-meter-high Mount Titlis, the village of Engelberg is famous for its 12th-century Benedictine monastery, where monks still live and work today. In the summer, the area is a popular base for mountain biking, hiking, golfing, and mountaineering, while the deep powder of the winter months lures skiers and snowboarders. If you're visiting Lucerne in the winter, the Mount Titlis Eternal Snow Half-Day Trip is a fun way to experience the beautiful Alpine scenery here as well as some snow-based activities. 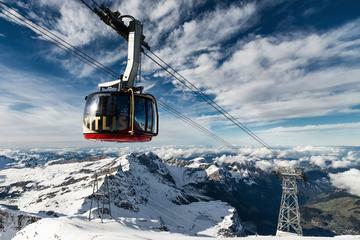 This 5.5-hour tour takes you to the top of the 3,020-meter summit of Mount Titlis, where you can try snow tubing, explore the Glacier Cave, take a cliff walk, and ride on a gondola and the Ice Flyer chairlift to see breathtaking views of the Bernese Alps. Perhaps the most unusual attraction in Lucerne is the enormous panoramic painting and sculpture depicting the escape of 87,000 members of the French army to Switzerland during the Franco-Prussian War in the winter of 1871. The circular painting and three-dimensional foreground are the work of Edouard Castres, who traveled with the army as a Red Cross worker. Completed in 1881, the work is 112 meters long and 10 meters high and considered one of the finest examples of panoramic art. As you stand in the middle of this painting, figures and actual objects, such as a rail truck, turn it into a three-dimensional scene. Entrance to this attraction is pricey, but if you have a Swiss Travel Pass, admission is free. About 80 kilometers from Lucerne, the World Heritage-listed Jungfraujoch is known as the Top of Europe, and is home to the highest railroad station on the continent at 3,454 meters. You can climb even higher on an elevator, which leads to the 3,573-meter summit of the Sphinx. A great way to soak up this stunning Alpine scenery is on a Jungfraujoch Top of Europe Day Trip. 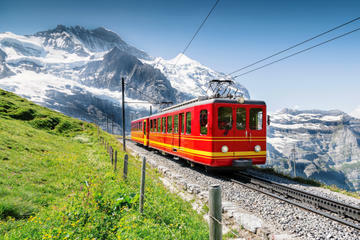 This 9.5-hour journey begins with a drive through the beautiful scenery of the Bernese Oberland and a cogwheel train trip up to the Jungfraujoch, passing through the mountain pass of Kleine Scheidegg, beneath the famous Eiger North Face. While on the summit, you have a chance to explore the Ice Palace and admire the breathtaking views from the Sphinx Observation Terrace. Luxury Hotels: With stunning lake and mountain views, but only a five-minute walk across the bridge from the train station, Hotel Schweizerhof Luzern is close to the Old Town and shopping. With the same views from its balconies, but farther along the lakeshore,Palace Luzern is a grand hotel on the lakeside promenade, between the Old Town and the Swiss Transport Museum. The modern Marriott-affiliate Renaissance Lucerne Hotel is two blocks from the station and lake, near the Rosengart art museum. Mid-Range Hotels: Hotel Krone Luzern stands in the center of the Old Town, near the city walls and right on historic Weinmarkt square. On the hillside above the lake near the Old Town, the half-timbered Hotel Hofgarten has large rooms and a free breakfast, about 10 minutes from the train station. Overlooking the lake beside the station, the modern Radisson Blu Hotel, Lucerne is handy to the boat landing for lake excursions and a 10- to 15-minute walk to the Old Town. Budget Hotels: Lucerne doesn't have many budget choices and even fewer close to the center, so you may need to depend on buses or a longer walk. Hotel Alpha is the most central, in a quiet neighborhood 10-15 minutes from the train station, but most rooms have shared facilities. With small rooms and very simple furnishings, ibis budget Luzern City is about a 15-minute walk to the Old Town. A 10-minute bus ride or half-hour walk to the center, Hotel Restaurant Spatz has attractive rooms with balconies and modern amenities, as well as free breakfast and convenient dining.